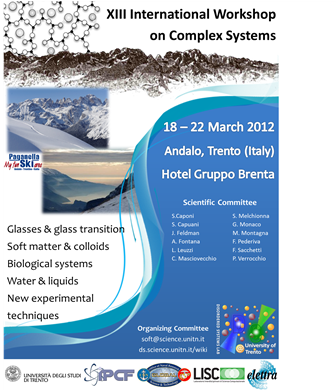 Beside the traditional interest on general aspects of disordered systems (glass transition, aging phenomena, rheological properties, jamming, relaxations) the workshop will also focus on the behavior of systems of biological interest (macromolecules, protein networks, protein-DNA complexes etc.) including numerical simulations. Half day will be devoted to modern theories of complexity, and a special session will focus on advanced techniques and future developments of neutron, x-ray scattering on complex systems. For the first time there will also be a session on Bose – Einstein condensates.